I love the song “The Middle” by Jimmy Eat World. I first heard it at an amusement park while waiting to ride the Batman ride. You know, the one where your feet dangle and you go on all those crazy loops and twists and turns. Every time I ride it, I think, “Oh my God, what am I doing?! Am I crazy? !” But then I actually ride it and remember how much I love it and that it’s actually one of the most awesome roller coasters ever. Anyway, the song is really great, especially for those of us who are still in the process of really finding out place in the world. It’s a very encouraging song, especially for anyone in between where they’ve been and where they hope to go. I’m only a few chapters away from being done with the first draft of my new manuscript, the sequel to Cemetery Tours. For a while now, I’ve been a little worried that maybe it won’t be as good, or that people won’t like it as much as they do the first one. What if people don’t like the plot? Or what if I’ve ruined their favorite character? I never thought about any of these things until I got close to finishing the sequel. Writing this one hasn’t been the same as writing the first one. With the first one, I went back and fourth, started it about four or five separate times, renamed characters, changed the plot, took out entire chapters and went back to rewrite them. With this one, I’ve worked straight through, start to finish, maybe taking out and rewriting a paragraph here or there, but overall, it’s been a pretty straightforward process. That might just be a sequel thing. I know the characters, I knew what I wanted out of this one before I knew what I wanted out of the first, and I’ve known all along how this one was going to play out. Honestly, I wrote the first book just so I could write this one. But still, the fears persisted that it just wouldn’t be as good, especially since I felt like I haven’t corrected as much on this one. The other night, however, I decided to scroll back and reread a few chapters. I am happy to report that I like them just as much as I like Cemetery Tours. I’ve come to learn that sometimes, when you’re writing a chapter or a scene, you often think to yourself, “Wow, I really just kind of blew that off. That was not my best effort. I just pulled all of that out of the air.” But then you go back, read what you wrote, and think, “Hey, that was actually pretty okay.” That’s pretty much the entire book for me. I know I will find things to change when I go back and do the first official read through (with the glitter markers for editing and what not), but overall, I am very happy and I finally think that readers will enjoy it just as much as they did Cemetery Tours. At least, I hope they will! I’m really looking forward to finishing the manuscript, not only because I’m ready to get back into the publishing process, but because I’m really looking forward to starting something new. I love Cemetery Tours and my characters, and I know I will write more books about them, but I have other ideas that I’m really excited about and that I want to get started on. Right now, I’m totally committed to the sequel and that’s a good thing, but other stories in my head are getting antsy. They want to be written too! Speaking of stories, my friend and I went to see Winter’s Tale last night. It was really a beautiful movie, and I’d love to read the book. I’d actually never heard of it until the movie was announced, but the book sounds amazing. I’ll admit, it wasn’t what I expected, but I really liked it. I’m very grateful that I got to see the entire thing, because my friend and I got lost twice on our way to the theater. She and her family recently moved about forty five minutes away, and neither of us knows the area very well. We ended up making a loop, and we arrived at the theater about ten minutes after the movie was supposed to start. Fortunately, we only missed a few of the previews. And the sunset was also really pretty, so you know, getting lost can sometimes be a good thing. That’s one thing about living in Texas. 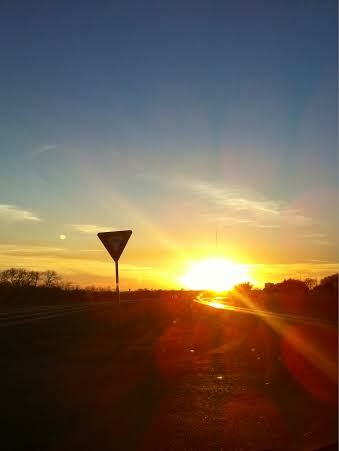 It doesn’t matter if you live in a big city, you’re never more than half an hour away from the typical, small country town scenery that most people envision when they think of Texas. I love that. However, it also means that you take one wrong turn and you’re suddenly on this small country road with no lights, no signs, and a lot of creepy old houses. Or cows. All I can say is thank God for the GPS, because it is so easy to get lost on those roads. In other news, Cemetery Tours has shown up in the “What are you reading” section of the UK’s The Guardian! Check it out! I connected with English author Tinsley Collins over GoodReads. 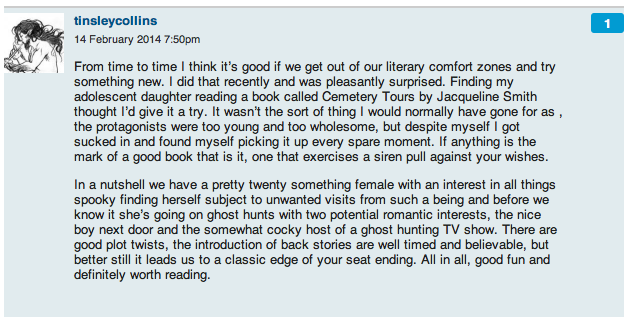 He saw that I had written a ghost story and wondered if I might be interested in doing a review exchange. I gladly accepted, being a big reader (and obviously, a huge paranormal fan). Also, when you’re in the independent author business, you never turn down a chance for a good review! Even if it isn’t a positive review, as long as it’s well thought out and constructive, it’s a good review. Mr. Collins wrote me a very good and positive review for Cemetery Tours, and I was very happy to reciprocate. His book, Seance, is awesome. I enjoyed it so much that I will be buying a copy for my own collection (I have a section in my personal library for authors that I know/fellow indie authors) on Friday as soon as I get my next paycheck. The main story takes place in a little London-based bookshop. Although I have never been to London, I am very much in love with the idea of the city, so it was easy for me to imagine and enjoy not only the story, but the scene and the characters as well. I imagined Theo as sort of a Tom Hiddleston, and honestly, who doesn’t love Tom Hiddleston? The story kept me guessing and engaged right up until the very shocking end. I think I actually gasped out loud. I’ve never considered myself a very good “reviewer,” just because I ramble and I don’t think I’m very good at formal writing. I’m much more of a conversationalist writer. But, for what it’s worth, here is the review that I posted on Amazon and intend to post on GoodReads when it goes up. “At first glance, Seance was right up my alley: a young man working in a London based old and rare book store meets a shy young woman asking if he had any books on ghosts, spiritualism, or seances. London, ghosts, and romance? I’m already sold. 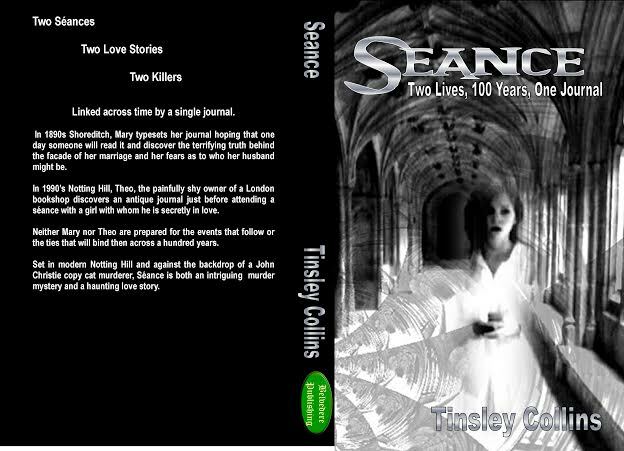 But it turns out that Seance, the second novel by author Tinsley Collins, is so much more than your typical paranormal romance. Yes, it tells the story of the skeptical and offbeat Theo, who, despite his quiet charm, has never fully found his place in the world or with people, and his strange connection with the equally awkward and timid Lucy, an avid believer in the paranormal. But it also follows the journal of Mary Bulstrode and her life as a new bride in the late 1800s. It has a pretty neat cover also. Check it out. I think the coolest thing about it is that Mr. Collins’ daughter designed it! Isn’t it awesome? Happy Monday, everyone! We’re expecting snow… again.